Towards the end of Clayton Christensen's book Disrupting Class, is an explanation of why change in schools often fails to make a lasting impact on student achievement. Christensen suggests this is because the tools that are used do not fit the circumstances schools find themselves in. Below I have drawn up a diagram based on the tools he writes about in Chapter 8 of the book, showing that there are many different sorts of tools that administrators can use to bring about change. 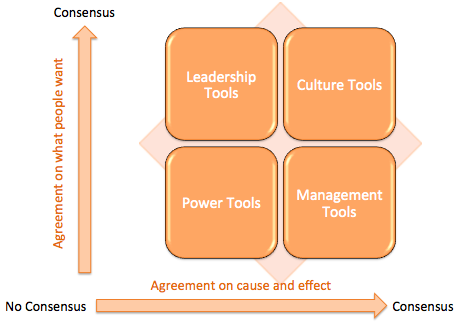 However which tool they should use will depend on the degree to which teachers and administrators agree on both the cause and effect of change, and the degree to which they all want the same outcomes. Christensen writes that it's the job of school leaders to convince teachers to work together for change. There are many tools that they can use that range from visionary speeches (carrots) to threats (sticks) but that most of these don't work most of the time. Christensen believes that this is because school leaders are using the wrong tools to try to manage change. He writes that there are two main mechanisms that can bring about lasting change - one is success, which leads to more consensus and ultimately a stronger culture, the other one is giving people a common language - he writes that all too often people can't agree on a solution because they can't agree on what the problem is. Power Tools - force, coercion and threats - are often used in situations where there is no consensus, and where there could even be antagonistic disagreement. These tools don't rely on negotiation or strategic planning, simply on imposing an external plan or perhaps a new curriculum on teachers who may not be convinced of its benefit. Hiring and promotion are also power tools. Management Tools - training, measuring, coming up with new procedures - are often used when there is some agreement about what can lead to better outcomes. The tools deal only with the processes, however, and because teachers may have different priorities or may want to achieve different things, training and other management tools may not have much impact on student learning. Leadership Tools - these focus on results and the leaders who bring about these improved results are those who are respected. Christensen writes: "Charismatic leaders who command respect ... often do not address how to get things done; instead they motivate people to just do what needs doing." In these schools the leaders are visionary and the teachers are in agreement about what they want to achieve, though they may have divergent views of how best to achieve these results. Culture Tools - these work best in schools where teachers have consensus on the priorities as well as the actions they need to take to achieve these priorities. In these schools little debate is necessary - though paradoxically these schools may actually be resistant to change as the tools work to preserve the status quo rather than to bring about change. Where are most schools in this matrix? Most schools, with the divergent priorities of teachers, administrators, students and parents (and often politicians too), fall into the lower left section of the matrix and therefore are often places where power tools could be used. Often the different groups strongly disagree about what needs to improve and how best to improve. I was interested to read what Christensen writes about democracy as he says it's only really effective in organizations where there is consensus on what is wanted and how best to get it; he argues that democracy is not an effective tool for radical change but instead school leaders need to work on developing a common language about what problems schools are facing, what changes are needed to be made and how best to achieve these changes, as well as developing a culture of cooperation so that strategic planning can be effective. The method of democracy is to bring conflicts out into the open where their special claims can be seen and apprised, where they can be discussed and judged. If we don't do this, if we simply say that schools are full of individuals with divergent priorities and therefore we should use power tools to bring about changes that are needed, then how will we cope with the response when teachers, students and parents feel their voices are not being heard and therefore stop participating in the debate? In some ways, though, Christensen is right. Democracy and difference can work together to bring about change, I think, if schools work together to develop a common language where these differences are discussed and debated and respected. Power tools can be used to bring about change, but for me it's more about hearts and minds - of getting schools from a situation where there is no consensus to one where all parties agree on the priorities and methods for bringing about change.